Moont Fuji (富士山, Fujisan, IPA: [ɸɯᵝꜜdʑisaɴ] ( listen)), locatit on Honshu Island, is the heichest moontain in Japan at 3,776.24 m (12,389 ft). ↑ 2.0 2.1 Triangulation stationis is 3775.63m. "Information inspection service of the Triangulation station" (in Japanese). 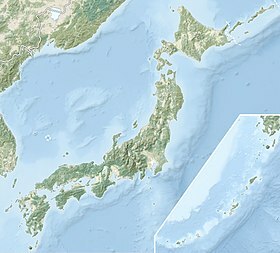 Geospatial Information Authority of Japan, (甲府-富士山-富士山). Retrieved February 8, 2011. ↑ "Map inspection service" (in Japanese). Geospatial Information Authority of Japan,(甲府-富士山-富士山). Retrieved 2011-02-08.